Throughout history garlic has been used for both culinary and medicinal uses—it has been mentioned to treat conditions such as low energy, poor digestion, respiratory problems and more. This relative of the chive, leek, onion and shallot dates back over 6,000 years. Garlic was known to Ancient Egyptians, garlic was consumed by ancient Greek and Roman soldiers and sailors, and garlic has long been a staple in the Mediterranean region. In a culinary sense, there are so many dishes that are brought to life with garlic that it’s hard to imagine some food combinations without the intense flavor of garlic mixed in—spaghetti sauces, pesto, chicken enchiladas, roasted chicken and many more. In addition to offering distinct flavor to numerous dishes, garlic offers great nutritional and health benefits. 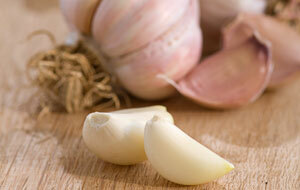 Studies have shown that garlic helps prevent heart disease, high blood pressure, and high cholesterol. Garlic is also used to help prevent certain types of cancer, including colon and stomach cancers. And garlic is also known to help prevent and fight the common cold. Garlic is a good source of calcium, copper and phosphorous, garlic is a very good source of vitamins B6 and C, and garlic is an excellent source of manganese. There are so many reasons to appreciate this incredible kitchen staple. So enhance your dishes and boost your health with the distinct, delicious flavor of garlic.